Still trying to decide what to be on Halloween? Halloween is just around the corner, and sometimes coming up with a costume idea at the last minute can get a little pricy. But, it doesn’t have to be! Check out these simple makeup ideas that you can use instead of a costume and all of them cost about ten bucks. 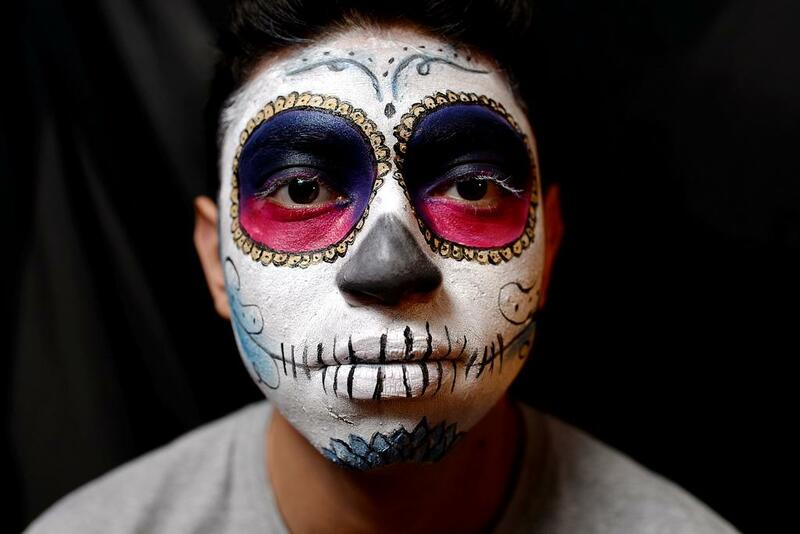 The iconic Dia de los Muertos skull, also known as “Calavera Katrina”, can be used as a creative look for halloween, and it’s one of the easiest and cheapest to recreate. Start off with a clean face, get rid of oils as much as possible, because this will ensure that the cream makeup will hold on longer and show up more. With the painters palette, take the red and create circles around the eyes, these will work to create the illusion of the sockets. Fill in the circles, and then take the black and fill in the top half lightly blending in the middle. Note: For darker colors, do not use any white cream paint on the eye area. Mix the pigments with a little bit of the white cream to create two different colors, these will work as the accent colors. Then take one of the colors and with a small brush create small half circles all around the eyes, and with the other color swirl out some designs on the face. Don’t worry about any of it being perfect, after all sugar skulls are hand painted! Take the black cream makeup and use it to give your details more of a contrast, it is also great to clean up around the eyes. Make a line across both sides of your cheeks, with the black face paint, and add vertical lines on the cheeks and lips. Note: Instead of the loose pigments, there is cream makeup available in a variety of different colors that can be used. Nothing screams halloween like fake blood on a fake wound. It looks gnarly and gross, and it’s simple to do. Don’t limit yourself to just the neck, a fake wound can be done anywhere. Just be careful on areas with hair, because peeling of the latex might hurt a bit. The liquid latex comes with a small sponge for an applicator, pour some of the latex on a dish and with that sponge, apply a layer of the latex where the wound is going to be. Repeat the first step to thicken the “fake skin”, to speed up the process a blow dryer can be used. 5 layers of latex were used on this look. With the concealer, match the color of the skin, and cover the latex. Hands work fine to blend the paint in this process. Carefully make a small rip with the tip of the tweezers (careful not to poke your skin), once the rip is done, you can use your hands to rip the latex into what will convert into the skin flaps. Cover what will be the blood with the red in the painter’s palette, and on the inside of the skin. Use a brush or your fingers to add red to any of the parts that outside of the cut where there will be blood. Take the black in the painter’s palette, and put it around the edges of the wound to add dimension and an illusion of bruising or rotting on the skin. Take the lip gloss and rub it on the red so it will look as if the wound is fresh and oozing blood. Add fake blood as desired, and voila! Since “The fox” went viral on youtube why not recreate the look? Let everyone know what the fox says, it’s a guaranteed hit look! Amy Marie Tripp poses as a fox for her Halloween costume on a budget. People will be asking her “What did you say?” when she tells them this Halloween look only costs around $10 while looking at different prices and bargins among Target, Walgrees, and Spirit Halloween. Darken the eyes with brown concealer, and wing the eyes with the black gel liner. The gel includes a brush. Follow the shape of the eye all the way to the front and make little tear drop shapes on the inside. Add false lashes if desired. With the gel liner, shape out the fox nose, fill it in, and then draw a line down all the way to the lips. With the cosmetic sponge spread the face makeup on the bottom half of the face. Fill the lips in with the black gel. Add little dots to shape the whisker holes. Amy Marie Tripp poses as a fox for her Halloween costume on a budget. Vampires don’t sleep! So use a brush to blend black and red all around the eyes to give it a creepy effect for the dark circles. It doesn’t have to be neat! To create the dead look of a vampire, use the cosmetic sponge and the Painter’s Palette to cover the face with white. You can add more layers to increase coverage, but only 2 layers of white were used for this look. Paint lips with the red, and use as much fake blood as desired around the lips! The red lipstick is optional since the palette is comes with red paint already.